Sometimes when my students do an intense assignment, when they’ve completed it, I ask them to write a reflection, typically in the form of a reflective essay. When we sit in peace after we’ve experienced something, it allows us time to be creative and think about what it all meant to us. I’ve decided to do the same about my trip to receive the Readers’ Favorite Bronze Medal that my first novel, Beneath the Mimosa Tree, won for Contemporary Romance. Reflection #1: I am lucky. As I was flying to Miami, I had a few moments to consider what’s happened to the book since it launched in March. I’ve received such lovely feedback and lots of great commentary. I’ve been booked for book club talks, book signings at stores, and have won an award. The book sits in a respectable position on Amazon and Barnes & Noble. The support I’ve received from people I know has been tremendous. However, more than that, the person sitting next to me on the airplane, my husband Anthony, has provided more support than I could have imagined. Additionally, my lovely and generous parents—who kindly offered to watch my children while we set off to the awards ceremony in Miami—have been there for me every step of the way. My in-laws have also offered a great deal of support throughout this journey. Reflection #2: People did come, Ray. Borrowing a quote from one of my favorite films, “Field of Dreams,” people did come, Ray, to the Readers’ Favorite Awards Ceremony. There were two cocktail hours out by the hotel pool on Thursday and Friday evening. My husband and I arrived on Friday afternoon and attended that night’s cocktail hour. I had the opportunity to chat with Debra Gaynor and many other folks who were there that night. It was a relaxed environment and a fantastic way to share our stories of writing and publishing. The actual Awards Ceremony was slated for Saturday in the afternoon. Prior to that, we had time to visit the Miami Book Fair, which was held in downtown Miami and is the largest book festival in the United States. The Readers’ Favorite booth was filled with our books, and that in itself, was a big thrill. After the Book Fair, my husband and I had lunch, and dressed for the Awards Ceremony. When I walked into the room, I was surprised to see how packed the venue was. There were several hundred authors and guests from all over the world. Two authors I chatted with traveled quite far to attend: one was from Australia, the other was from Switzerland. They both told me that in their countries, winning an American award was prestigious. I met Dianna Young, who came from South Dakota to receive recognition for her book, Muted Grey. She kindly gave me a copy, and I could not put it down on the plane ride home. I met Chloe JonPaul, author and Bronze medal winner for The Business of Children. And I would be remiss if I didn’t mention the lovely Amanda Grieme, author of Dear Prudence, which won a Silver medal. Not only did we get to mingle, but each author was brought up on stage to receive his or her award. I was so proud to have the bronze medal draped around my neck by Debra Gaynor who gave me a big smile and a congratulatory hug. My husband took pictures, as did a Readers’ Favorite staff member. As I exited the stage, there was another photo op area where a Readers’ Favorite staff member took another photo of me posing with my book next to the staging area, replete with a banner. Later these digital photographs were provided to me free of charge, which I thought was a nice touch. The ceremony ended and a lovely buffet was served. We all mingled and chatted as we got to know each other better. People did come, Ray. And I was blessed to meet them. 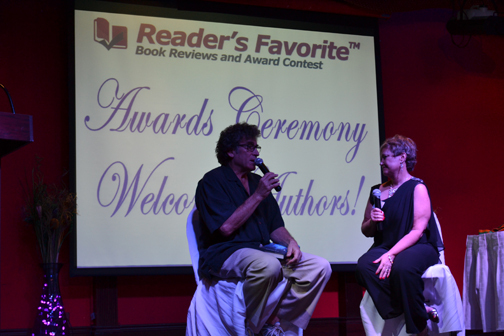 Paul Michael Glaser and Debra Gaynor discuss writing and inspiration pre-awards ceremonies. I loved that she said this to us. For me, it’s so true. Even as I’m typing this now, I feel compelled to write and to share these thoughts with you. 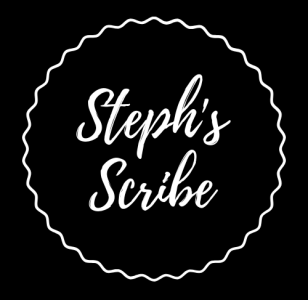 Writing a blog is a lot different than writing fiction, but it’s writing nonetheless, and I love the entire process of it. Paul Michael Glaser, director, actor (formerly of the television show “Starsky & Hutch”), and now author of Chrystallia, spoke at the awards ceremony, along with Rhonda Fischer, author of Randy Kazandy; they motivated all of us to continue on our journeys. 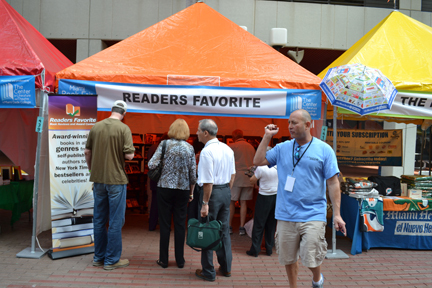 Readers Favorite Tent at the Miami Book Fair. Miami, Florida. November 15, 2012. Reflection #4: You Can’t Have a Journey Without Readers. My final reflection is about you, readers, and I can sum it up quite succinctly. Authors need readers, and I am thankful for the ones I have, and the ones that I may have in the future. I am diligently working at writing my next novel, and I hope to get it out there in the near future. As the Founder and CEO of Readers’ Favorite I’d like to thank you for your comments. What began as a love for reading turned into an opportunity to work with authors and encourage them to continue writing. I wish to thank them for sharing their imagination and life with others. I’d also like to state that I do believe that authors write because they must. There is a deep desire within them that makes putting words on paper (or a computer screen) a need. It is my goal in life to say keep writing for you are touching someone else with your words. What a great essay Steph! I’m the 2013 Gold medal winner for children’s fantasy this year and I’m nervous and excited at the prospect of attending such a massive event. I was a little on the fence about whether to attend (I live in Texas) but am thinking about making it a family affair and bringing my husband and two kids to the event. The book has been co-written by my husband and I but the girls have contributed to the story as well as watched the business side of things grow. I think it would be amazing for them to see and participate in this event. Thanks for sharing the great insights about your experiences and congratulations on your award! If you can go to the Awards Ceremony, you should go. It was well worth it, and a big boost to the writing endeavor. There were many people who brought their kids and families. It was a great time to just meet other people who do what you do and hear their stories. Congrats on your award, and get on that plane! Hi Steph, My book Not in the Pink is a bronze aware winner for 2015. I have been wavering about whether to attend the awards. Reading your genuine, heartfelt experience has swayed me to go and take my bow on the stage. As a “writer” you would think I could spell…. “award”….